Playtest Carpet is among the projects featured in the Spring 2016 issue of Cover. Check out the “Insight” column. COVER 42 features the latest work by Milan-based rug brand cc-tapis in collaboration with designers such as Patricia Urquiola and Federico Pepe. COVER highlights Ai Weiwei's latest art installation in Paris, Tom Dixon's new carpet collection for Ege carpets and Iwan Maktabi's fantastic One Carpet for Love collection with Lebanese designers. The new issue also features Jameel Prize 4 nominee Dave Chalmers Alesworth, PORCUPINE ROCKS Ltd, the making of The Afghan History Carpet, innovative Belgian company Papilio and much much more! Interference appears in Progetto grafico 27, an issue on the theme of “play." Progetto grafico is an international graphic design magazine published by Aiap, Italian association for visual communication design. A reference for the culture of visual communication design in Italy since its beginning, Progetto grafico is a critical forum on graphic design. Sixteen Tons is on the cover of the book Works of Game by John Sharp. Below is the official overview of the publication. We love it! Games and art have intersected at least since the early twentieth century, as can be seen in the Surrealists' use of Exquisite Corpse and other games, Duchamp's obsession with Chess, and Fluxus event scores and boxes -- to name just a few examples. Over the past fifteen years, the synthesis of art and games has clouded for both artists and gamemakers. Contemporary art has drawn on the tool set of videogames, but has not considered them a cultural form with its own conceptual, formal, and experiential affordances. For their part, game developers and players focus on the innate properties of games and the experiences they provide, giving little attention to what it means to create and evaluate fine art. In Works of Game, John Sharp bridges this gap, offering a formal aesthetics of games that encompasses the commonalities and the differences between games and art. Sharp describes three communities of practice and offers case studies for each. "Game Art," which includes such artists as Julian Oliver, Cory Arcangel, and JODI (Joan Heemskerk and Dirk Paesmans) treats videogames as a form of popular culture from which can be borrowed subject matter, tools, and processes. "Artgames," created by gamemakers including Jason Rohrer, Brenda Romero, and Jonathan Blow, explore territory usually occupied by poetry, painting, literature, or film. Finally, "Artists' Games" -- with artists including Blast Theory, Mary Flanagan, and the collaboration of Nathalie Pozzi and Eric Zimmerman -- represents a more synthetic conception of games as an artistic medium. The work of these gamemakers, Sharp suggests, shows that it is possible to create game-based artworks that satisfy the aesthetic and critical values of both the contemporary art and game communities. John Sharp is Associate Professor of Games and Learning at Parsons the New School for Design and a member of the game design collective Local No. 12. Nakworks is in Witten (Germany) for 72 Hour Interactions - as one of the Jury members. Sixty architects, game designers, craftspeople, tinkerers and city planners formed five international teams and competed in a special World Championship. They challenged themselves in only 72 hours – three days and nights – to design and buidt a temporary structure that invites people to come together in play. Katja Aßmann (Artistic Director Urban Arts Ruhr, Germany), Philipp Misselwitz (Urban Planner, Germany), Nathalie Pozzi (Architect, Italy), Eric Zimmerman (Game Designer, USA), and representatives of the Municipality of Witten. Zurich University of the Arts offers a broad range of degree programs in education, design, film, art and media, dance, theatre and music. Closely interrelating teaching and research, it provides an ideal setting for transdisciplinary projects. Architecture of the Senses: An introduction to Constructed Space and Human Experience was a 3-week intensive workshop ( 21 October · 11 November 2013) given at the Zurich University of the Arts (ZHdK). The workshop included students from multiple disciplines, including Concept Design, Game Design, Graphic Design, Industrial Design, and Interaction Design. The goal of the course was to understand space design through a number of lenses, from the social and cultural use of space to its material form and sensed experience. The class included readings and space analyses by students, but the focus was a group collaborative project. The Fall 2013 issue of Aperture Magazine is out… and Interference is among the featured projects. Check out “A Century of Play” in the “What Matters Now?” column, illustrated with a photo by Cameron Sterling. Interference is featured in GAME. MOCO LOCO is a web magazine dedicated to modern contemporary design and architecture. Founded by a partnership between Intel and VICE, The Creators Project celebrates visionary artists across multiple disciplines who are using technology in innovative ways to push the boundaries of creative expression. The Graduate School for the Arts is a international, post-graduate interdisciplinary program at Berlin University of the Arts. The Fellows in residence are highly qualified graduates from all artistic and academic disciplines who regard the communication and exchange with other disciplines as a prerequisite for their work. The visiting professorship, in partnership with game designer Eric Zimmerman, revolved around the concept of playtesting. At regular meetings, the Fellows shared works in progress in order to spark critique and further development. In the spirit of playtesting, the works were not just discussed, but instead were experienced: feedback was based on the actual experience of a working project in progress. In addition, the summer professorship included a requirement of presenting a public project during the residency. To this end, the project Starry Heavens was staged at the Play Publik festival in Berlin, in collaboration with Eric Zimmerman. Don’t Follow these Rules! A Primer for Playtesting is an essay written with Eric Zimmerman that was inspired by the experience at the University of the Arts. 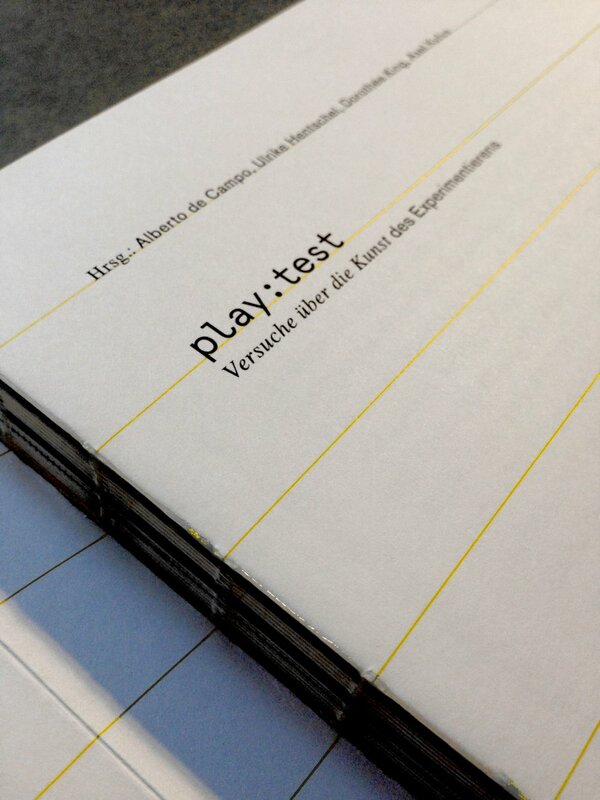 It outlines best practices for a playtesting design methodology and is included in the collection play:test, published by the Graduate School of the Arts in Berlin. Rebecca Jones and Nathalie Pozzi met in the Watermill Center in Southampton, Long Island while working with theater designer and artist Robert Wilson. Naturally, a discussion around theater and architecture developed – granting each of them a new understanding of their interests in the field. A+U publishes an article about the Wood Program and the Lastu Summer Sauna a project developed under the Wood Program of Helsinki University of Technology. Peter Westerlund (Finland) with Adam Guernier (Australia), Nathalie Pozzi (Italy), Isshin Sasaki and Koji Hashimoto (Japan), Max Lönnqvist (Sweden), Sevra Davis and Nathaniel Moore (Usa). Wood Works publishes the Lastu Summer Sauna, a project developed under the Wood Program of Helsinki University of Technology. Puu publishes an article about the Lastu Summer Sauna, a project developed under the Wood Program of Helsinki University of Technology. Arkkitehti examines architecture critically from several angles. The topics addressed range from urban planning to holiday homes, from aesthetics to ecological construction, and from the history architecture to the latest global trends. Established in 1903, Arkkitehti is published by the Finnish Association of Architects. Ark publishes the Lastu Summer Sauna, a project developed under the Wood Program of Helsinki University of Technology. As part of the Wood Program at the Helsinki University of Technology, the project team undertook the renovation of a birch bark roof and reconstruction of rail fences on the Pien-Toijola farm. This traditional Finnish farm is located on an island in the Riistina parish, in the Eastern Finnish lake district, where the Toijonen family has practiced farming since 1672. The Pien-Toijola farmhouses illustrate building methods and styles that range from the seventeenth century up to the second half of the twentieth century. Finnish farm compounds typically consist of several family residences and their various associated storehouses. The project work included the renovation of the horse stable roof and the reconstruction of rail fences which connect the main yard to the sauna and the servant’s house. New building materials were used to replace decayed elements, yet the restoration followed traditional Finnish construction methods of woodcutting, beam joining, and waterproofing, and contributed towards an ongoing maintenance program. The Wood Program at the Helsinki University of Technology is a postgraduate program in architecture. The program attracts young architects from all over the world and focuses on the aesthetic and technological qualities of wood, from forest growth to final engineered product. Study in the Wood Program includes the construction of original buildings, restoration of historical sites, investigation of contemporary production techniques, and the history of wood in architecture. The 2003 Wood Program participants included Sevra Davis, Adam Guernier, Koji Hashimoto, Max Lönnqvist, Nathaniel Moore, Nathalie Pozzi, Isshin Sasaki and Peter Westerlund. "The Wood Program explores the technical and architectural properties of wood, providing a thorough and all-round view on the whole chain of wood construction, beginning with the tree in the forest and ending up with an experimental wooden building." 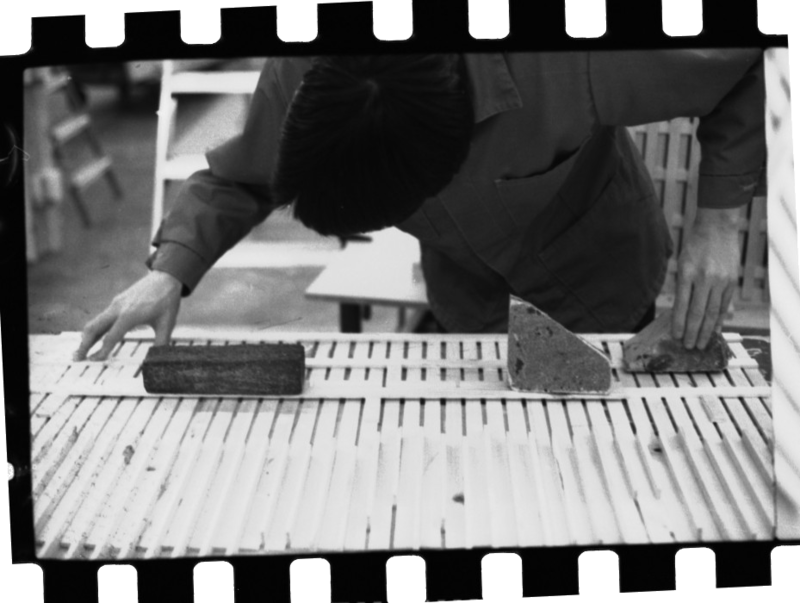 The images show the fabrication of a sauna. The wooden structure is made of pre-assembled elements, to be mounted on-site.